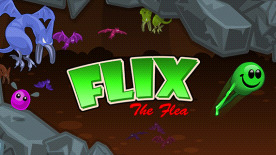 FLIX THE FLEA is the high flying platformer from one-man game studio, Psychotic Psoftware. Flix is a flea who lives on a Dog, who lives on a space-exploring rocket-ship. While exploring a new planetoid, Flix takes an unfortunate nosedive into a chasm. It's your mission to guide Flix up and out of monster infested caves in the hopes of getting him back to his rocket-ship and the sanctuary of his cozy doggie home. Highly inspired by the wonderful 8-bit classics, Flix The Flea returns to an almost forgotten sub-genre of cutesome high-jumping platform games. With a host of challenging environments and features, Flix creates just the right balance of fun and frustration for a very entertaining & addictive gaming experience!